The Gladys Brooks Book and Paper Conservation Laboratory recently completed the rehousing of a fascinating collection of seventeenth century ivory manikins (small sculptures which open to reveal details of human anatomy). 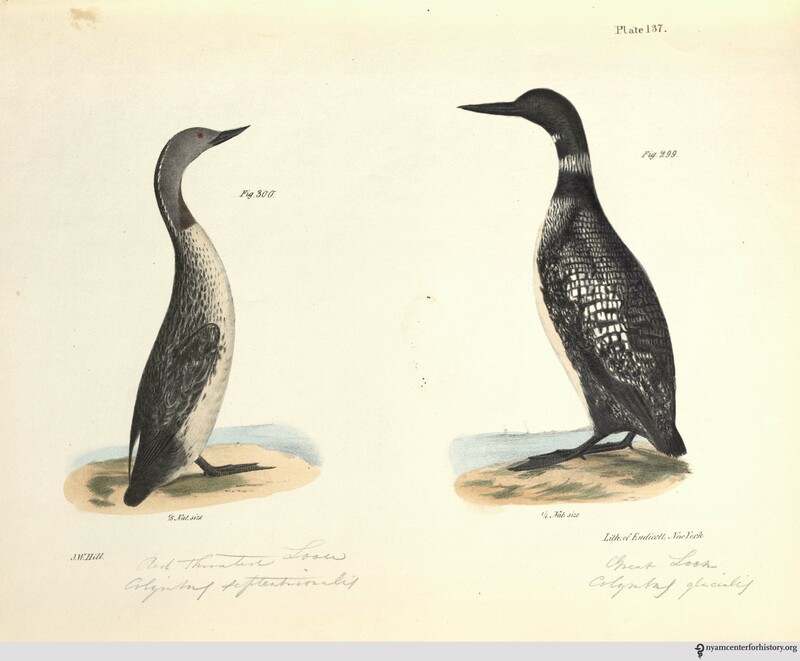 As with most items that are treated in the conservation lab, recent consultation and study of the collection by a researcher provided the starting point for conservation assessment and a review of the current housing. Each manikin includes delicately carved features and is often attached to a support of carved wood. Finely detailed pillows are a common feature on items in the collection. Webster Anatomical Manikin Collection #27. In most female manikins, the abdominal wall removes to reveal tiny painted organs and a small fetus connected by a linen cord. Webster Anatomical Manikin Collection #27. Quite apart from the écorché figures, the ivory eyes, ears and skeletons, yet another product of the carver’s skill was produced in considerable numbers during the seventeenth and eighteenth centuries. This was a small manikin of a man or a woman measuring from 12 to 24 centimeters in length with the anterior thoracic and abdominal wall removable to reveal the viscera. By far the greater number of these lie supine on a stand or in a fitted case and are carved in ivory; some stand on a small pedestal. Although they do occur in pairs, male and female, it is more common for single female figures to be found and in almost every case the figure is represented in an advanced state of pregnancy; the foetus being attached to the uterus by a red cord or else loose within the cavity. The term manikin is preferred as it denotes a figure with articulated limbs, the moveable arms being essential for allowing the removal of the abdominal wall. The New York Academy of Medicine Library holds seven manikins, including a rare male and female pair. The manikins do not contain physical markings to indicate artist or date of creation. We do know that one of the largest producers of ivory manikins was Stephan Zick (1639-1715) of Nürnberg and that the Zick workshop produced possibly more manikins than any other workshop in Germany. Unlike the detailed écorché figures designed for study purposes, it is unlikely that the manikins were used for teaching or instruction. The lack of detail on the internal organs would limit their function in this capacity. Le Roy Crummer (1872-1934) describes a female patient who remembers learning about pregnancy in 1865 with the aid of an ivory manikin, although such instruction does not seem to be the intended use of the manikins. It is possible that the manikins were considered objects of curiosity, collector’s items that perhaps represented a growing interest in women’s health and the physiology of pregnancy. It is also conceivable that the manikins were given as gifts to newly married couples as good luck tokens intended to signify a future of healthy childbirth. 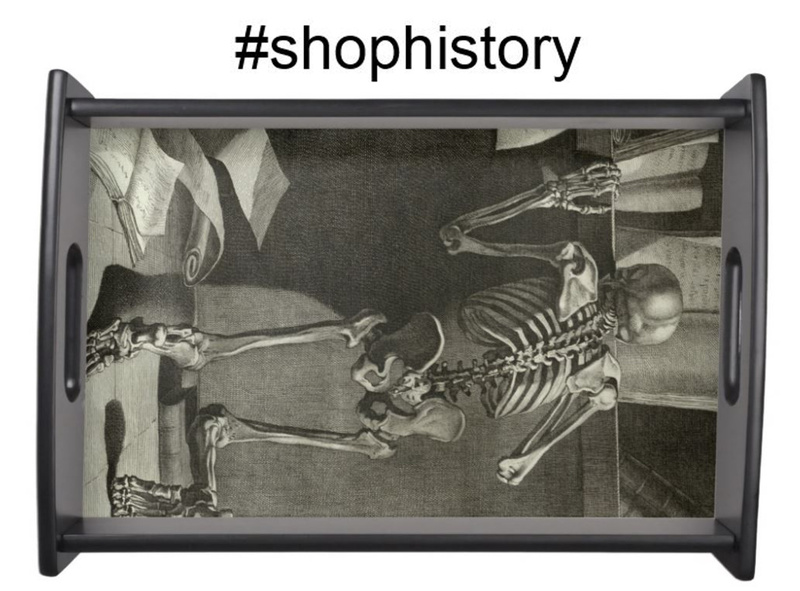 Regardless of the original purpose, as art form the manikins represent an intriguing merger of Baroque art and science. Maintaining complex three-dimensional moveable objects such as the manikins is similar to the work required to preserve rare books in good working condition. In both cases, proper storage and housing are critical for long term preservation. Enclosures designed for the delicate manikins must account for many moving parts, including fragile ivory fingers and tiny internal organs. The previous temporary housing consisted of wrapping the manikins in acid-free tissue and tying labels to each manikin, stacking them in a Coroplast® polypropylene box. While this solution protected the manikins during storage, it did not allow for easy viewing and required a complex unwrapping and re-wrapping procedure to access each manikin. The previous temporary housing did not facilitate easy access and introduced the possibility of damaging the delicate manikins during the unwrapping process. The new enclosure takes into consideration the needs of each manikin by creating a small custom designed tray with two types of polyethylene foam to make sure that each manikin fits securely inside each tray: dense Ethafoam® provides basic support and is lined with softer Volara® foam in areas where the foam directly touches the manikin. The trays are fitted with handles of linen tape that allow the tray to be removed from a larger housing without touching the manikin. The trays are designed to fit into pre-made archival boxes purchased from Gaylord Brothers. The pre-made boxes were retrofitted with Ethafoam® supports lined with Volara® foam. The addition of the Ethafoam® allows the boxes to be easily transported from the environmentally controlled stacks to the Rare Book Room, minimizing vibration and movement within the box. Yungjin Shin, Collections Care Assistant, designed the interior of the storage boxes, taking advantage of the box depth to fit as many trays in each box as possible. In this case, the manikin’s tortoise shell bed and pillow rest in a tray above the actual manikin, pictured in the next image. Webster Anatomical Manikin Collection #23. Chloe Williams, 2017 Pre-Program Intern, designed customized trays for each manikin, taking into consideration the contours of each object. Webster Anatomical Manikin Collection #23. As an additional support, each tray includes a custom fitted pillow of Tyvek® filled with polyester batting that rests on top of each manikin. The pillows further minimize shifting within the box without introducing a rigid support that could damage the fragile ivory features of each manikin. Typical of most artifact housings, each box is labeled with a photograph of the contents so that there is no confusion about which manikin is inside. Boxes labeled with photographs allow for easy identification of contents without having to check inventory numbers or search for less obvious identification marks. Gloves are used when the manikins need to be handled to reveal the intricate internal organs. In situations where the manikin needs to be removed from the tray, the placement of supports within each tray is intentional and designed to encourage the use of two hands when removing the manikin. The use of gloves when handling the manikins protects the item and allows for better control when handling the smooth ivory surface. Working with this extraordinary collection has allowed the conservation staff to refine our skills in objects housing and to begin designing similar projects to preserve the rich collection of artifacts that complement the Academy Library’s rare book collection. K.F. Russell. Ivory Anatomical Manikins. Medical History 1972; 16(2): 131-142. Eugene von Philippovich. Elfenbein. Munich: Klinkhardt und Biermann, 1981. Le Roy Crummer. Visceral Manikins in Carved Ivory. American Journal of Obstetrics and Gynecology 1927; 13: 26-29. The centenary of the United States entry into World War I was this past April. But wars—even those having such sharp cease-fires as this one did, on November 11, 1918—rarely have well-defined beginnings and endings. Even before the official American entry, Americans served in France from the outbreak of the war in 1914. Expats in Paris formed the American Ambulance (the term then meant field hospital), which spun off the American Field Service, charged with transporting wounded soldiers from the front line and providing immediate care. In direct combat, the famed Lafayette Escadrille was founded in 1916, made up of volunteer American air fighters under French command, who battled the Germans up until actual American military deployment two years later. And in the realm of battlefield medicine and surgery, Americans served as volunteers in France from 1914 up to 1917. One of the most noted was Dr. Joseph A. Blake (1864–1937) who, at the outbreak of war, resigned from his prominent surgical positions at Presbyterian Hospital and Columbia College of Physicians and Surgeons, and went to France. 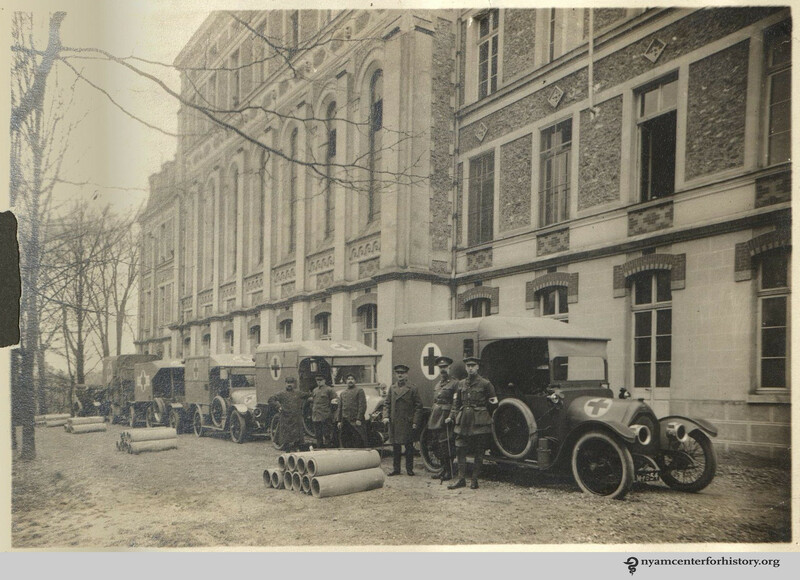 There he successively headed up three volunteer hospitals in Neuilly, Ris-Orangis, and Paris, up until his induction to the American military medical corps in August 1917 where he continued his work. 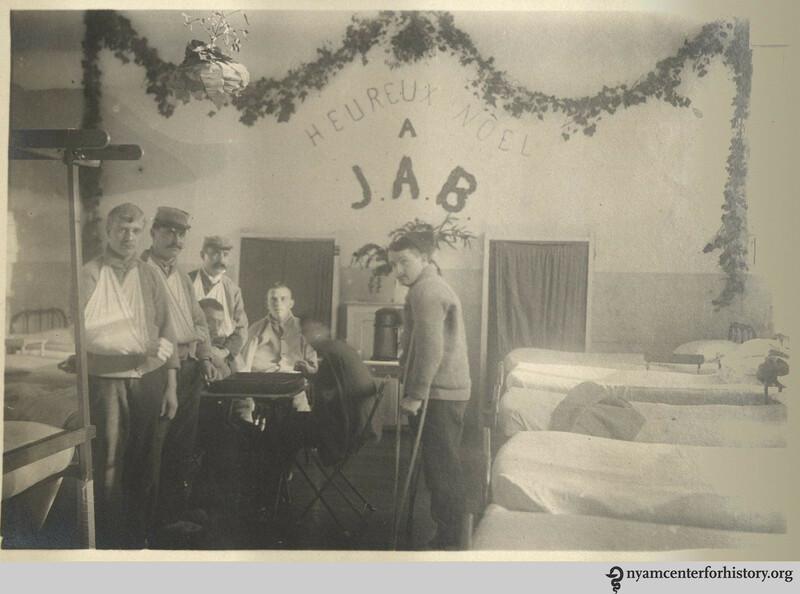 “Merry Christmas to J.A.B” [Joseph A. Blake, chief surgeon and hospital director], December 1916. 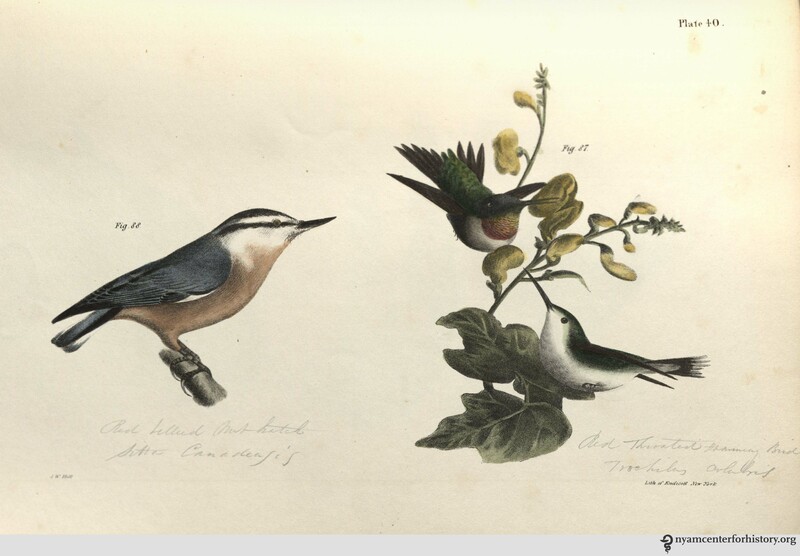 Image: Charles Terry Butler papers, New York Academy of Medicine Library. My two year internship would be put off six months, but here was the opportunity to learn the treatment of serious war wounds under a great surgeon, perhaps my only chance to have such training, and if the United States were forced into the war, I would be much more useful to the Army. Blake promised Butler scant remuneration, 400 francs travel expenses each way, and 100 francs a month salary, relying on his “contribution” to aid the cause. 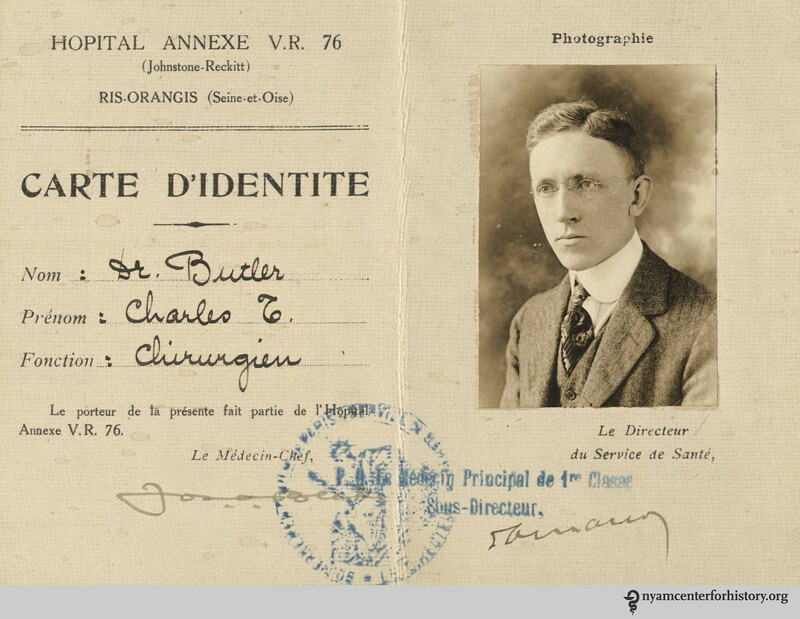 Charles Terry Butler identity card for Ris-Orangis hospital, June 1916. 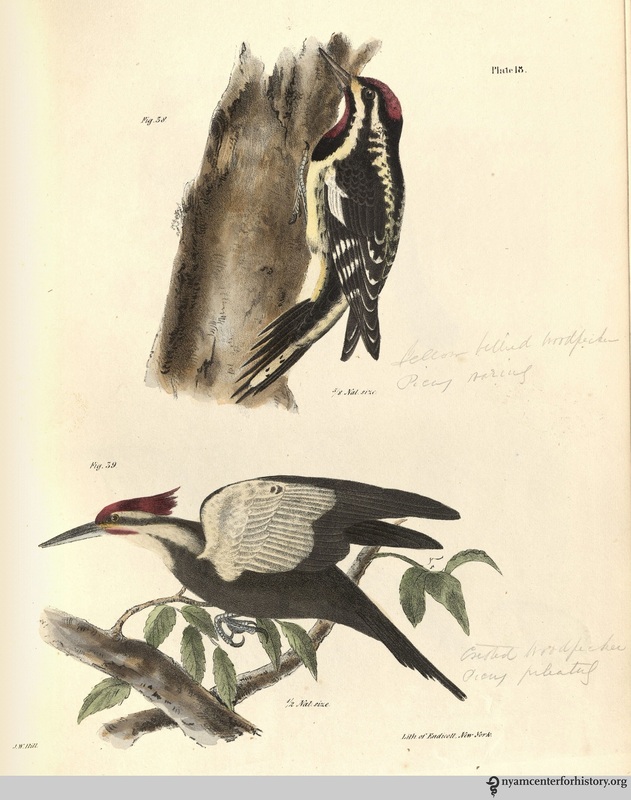 Image: Charles Terry Butler papers, New York Academy of Medicine Library. Butler left for Liverpool on May 27, and—after a long period of negotiating his credentials to enter France, as authorities were concerned about German infiltrators—he arrived at the Ris-Orangis hospital on June 10. A converted college, long empty before its refitting, the hospital was organized by two English patrons and operated by private donations and support from the French military. 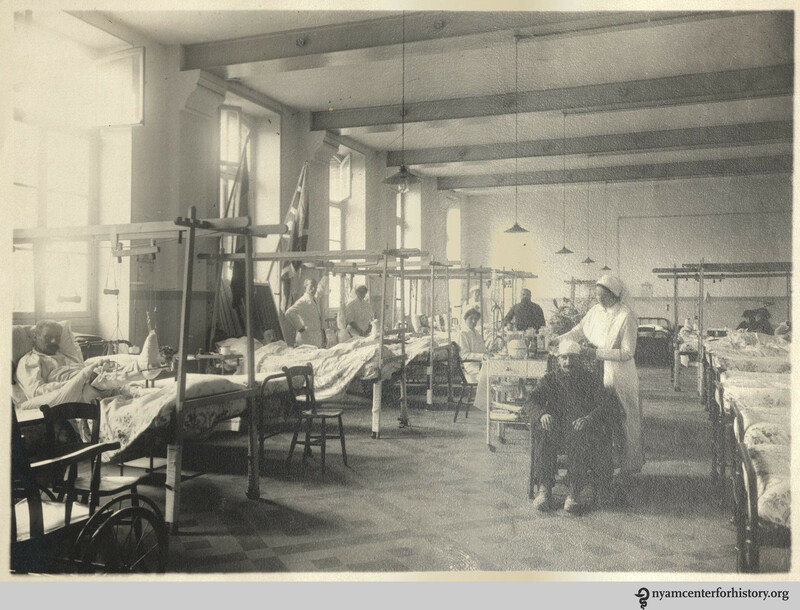 The hospital held about 200 beds, with a surgical theater and supporting radiology and bacteriological facilities, as well as, of course, kitchens and laundries. 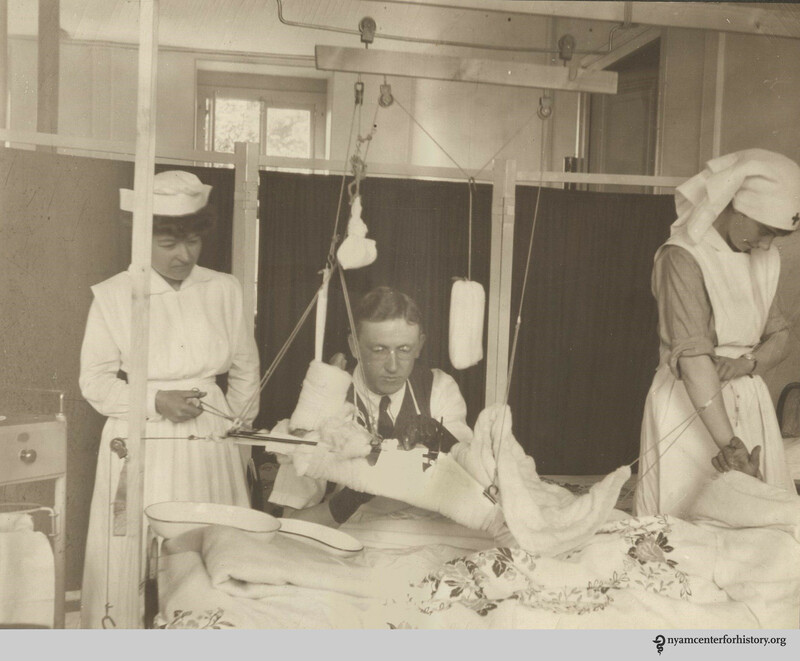 Charles Terry Butler dressing a wound with the aid of two nurses, 1916. 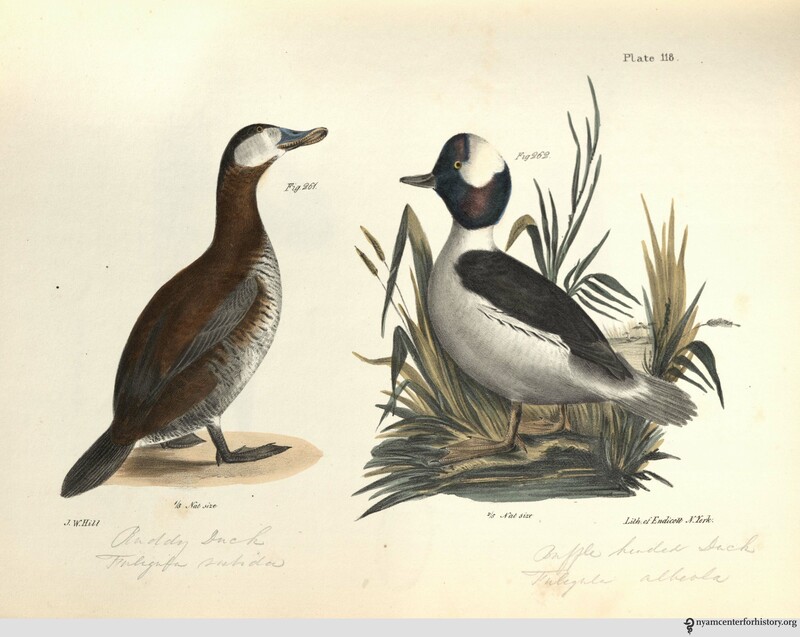 Image: Charles Terry Butler papers, New York Academy of Medicine Library. 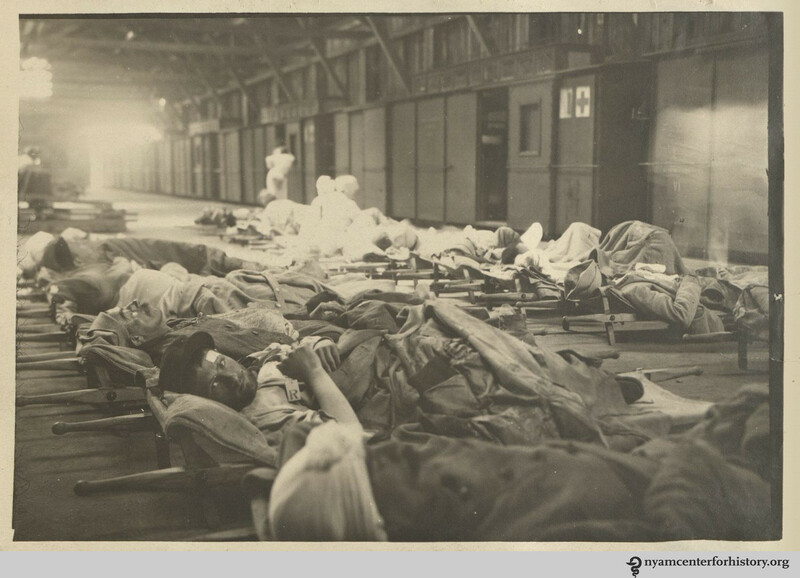 A recovery ward, 1916. The flags of Britain and France are mounted at the window, as this hospital was a joint effort: operated within the French military hospital system, sponsored by private British philanthropy, and staffed by American surgeons. 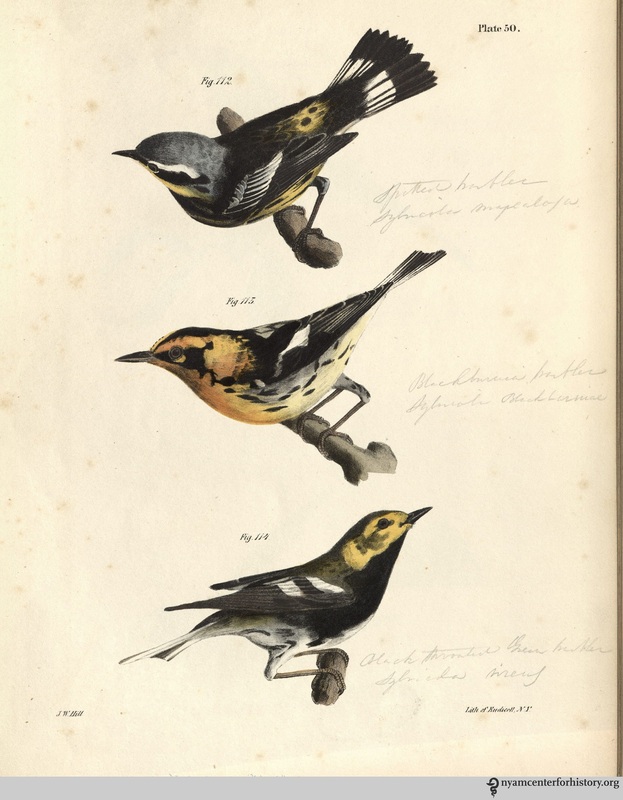 Image: Charles Terry Butler papers, New York Academy of Medicine Library. The hospital has about 200 beds, and on my arrival I was put in charge of two wards with over 90 beds and some 80-odd patients. It was some contract to start with, and for two or three days I hardly knew whether I was coming or going. I did about forty dressings a morning with three nurses to help me, and two getting their patients ready for dressing ahead of me and bandaging up when I was through. It took over three hours of hard, steady work. Last Sunday, 65 new blessés arrive—the majority of them frightfully wounded. They come by ambulance from a distributing railroad station some 6–7 kilometers away. Arriving in bunches of four or eight, they are sent immediately to their beds. Most of the orderlies had been given leave that day, so we doctors had to turn to and help carry them to the wards. (It isn’t particularly easy carrying a large man on a heavy stretcher with his trappings up three flights of stairs.) There they are undressed; their clothes put in a bag, tagged, and sent to be sterilized and cleaned; and then bathed. . . . The next thing is food. Many have not had anything for 24 hours or more while en route from the front or the last hospital. Then the surgeon comes along. Dressings, casts, splints, etc. are removed so as to see the condition and nature of the injury. It would be impossible to describe the state of some of the wounds—many not having been dressed for several days, some even for 10 or 14 days. A hasty and rather superficial cleansing must suffice for the time being, until the patient comes back from the X-ray room. … All the wounds are terribly infected, and a large percentage have foreign bodies (balls, pieces of shell, clothing, stones, dirt, etc., etc.) lodged…. [Surgery followed, aided by X-ray and fluoroscopy.] The recoveries are wonderful. Men whom no one would expect to live, ordinarily, in a civil hospital, hang by a hair for days and come around O.K. Butler noted that the average length of stay at the hospital was almost 50 days. 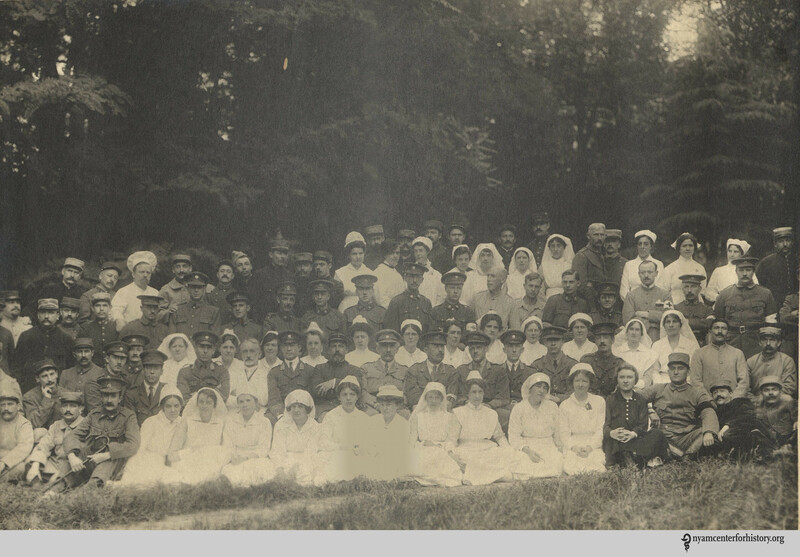 The staff of the Ris-Orangis Hospital, 1916. Dr. Joseph A. Blake, director, is the central figure (second row, seated); Charles Terry Butler is the third man to his left. 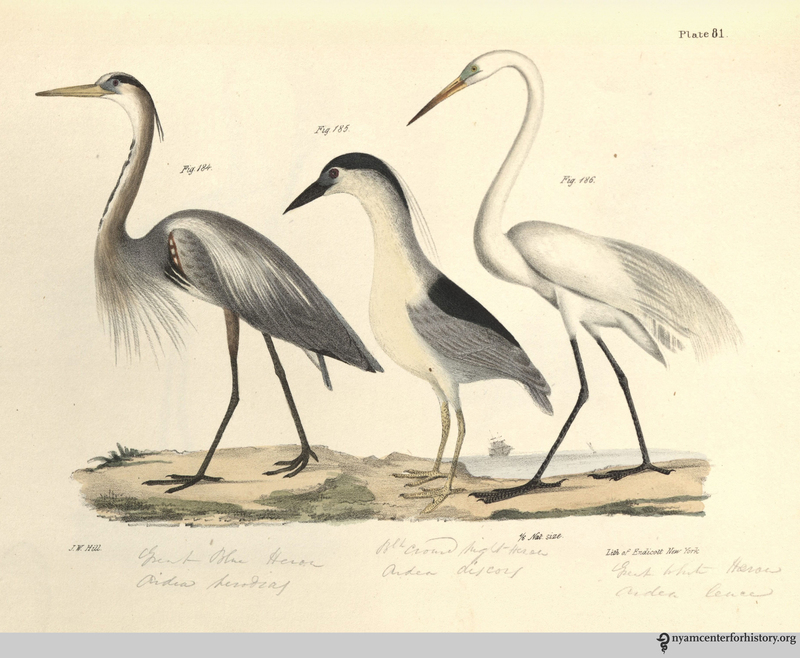 Image: Charles Terry Butler papers, New York Academy of Medicine Library. Ris-Orangis was considered one of the most successful hospitals in the war. [One of the founders, Harold J. Reckitt, wrote a detailed history of the hospital, V.R. 76: A French Military Hospital (1921)]. Butler spent most of his time dressing wounds, with little occasion for actual surgery. He returned to New York in January 1917 to take up his internship at Presbyterian. But upon the American entry into the war in April 1917, he was commissioned a first lieutenant with the United States Medical Corps, serving into 1919—the topic of a future blogpost. Butler’s experience at Ris-Orangis was crucial to his surgical accomplishments in this second phase of war service. After the war, he entered private practice, but by 1923 ill health—apparently resulting from wartime conditions—led Butler to retire. Moving to the Ojai Valley of Ventura County, California, he became a prominent civic and cultural leader up to his death in 1980. Transporting the wounded by train, 1916. Ambulances and drivers of the Ris-Orangis, 1916. Butler, Charles Terry. A Civilian in Uniform. Butler, 1975, p. 28. A Civilian in Uniform, p. 49. Blake to Butler, 29 April 1916, A Civilian in Uniform, p. 49. Butler to “Uncle Clare” [Clarence Lyman Collins (1848–1922)], 17 June 1916, A Civilian in Uniform, p. 57. Butler to “mother” [Louise Terry Collins (1855–1922)], 7 July 1916, A Civilian in Uniform, p. 62–64. Charles Terry Butler, “Ris-Orangis, France, 1916,” photographic album. 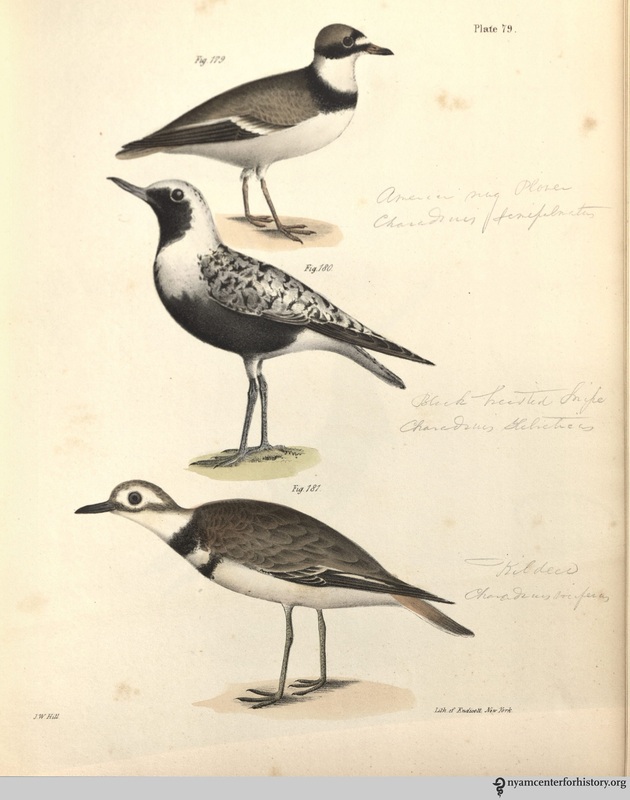 Charles Terry Butler papers. 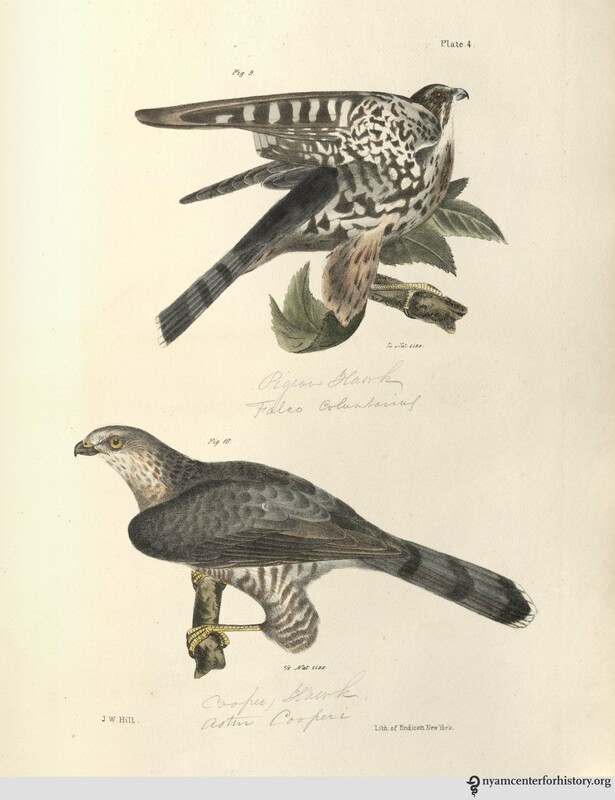 New York Academy of Medicine Library.